A private collector's stable of hot rods and sports cars painted on the wall of his great room - pool table alcove overlooking the Los Gatos Hills. 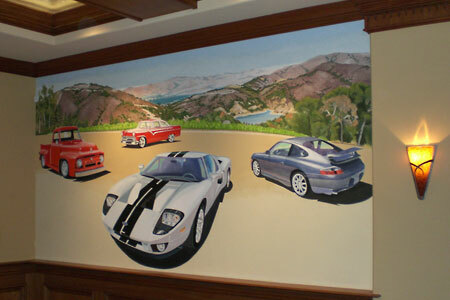 The mural was to include a 1965 Ford 350GT, a 1956 Ford Pickup, a 1955 Ford Crown Victoria and a 2001 Porsche Carrera displayed in an exterior setting with vineyards & panorama landscape of the valley. Specifics: 11.5 feet wide by 6 feet tall. Acrylics on plaster. Painted on location.